LPTC has a long history in competitive community tennis. Historically, we have fielded adult league teams that reflect our members’ interests (which we survey at tryouts in the spring). In 2018 we fielded InterCounty A, InterCounty C, InterCounty 55+ and two daytime Ladies’ Teams in the Toronto Ladies’ Tennis League and North York Tennis Association. There are two Junior teams, U12 and U18 in the Tennis Toronto Junior Doubles League. All these teams play competitive doubles against other clubs around Toronto. Matches generally alternate between Lawrence Park Tennis Club and other clubs. To join the adult teams, members try out during the designated tryout sessions in April and May (sign up will be sent to members in our Between the Lines newsletter in the spring), and must be available to play most dates of the league matches. Try-outs are held indoors so that weather is not a factor and a small fee is charged to cover court costs. Team matches and practices are shown on our online Club calendar once the schedule for the summer has been set. Please note that teams will only go forward if there is sufficient interest. It is our goal each year to test whether we are offering the right mix of teams to suit our members preferences, hence the survey at try-outs. After try-outs we will determine which of our teams are able to field a full roster. For any teams that are no longer sustainable due to insufficient numbers of interested players, the LPTC Board will review the viability of that team for the season. Our two InterCounty Teams each consist of members who compete in men’s doubles, ladies’ doubles and mixed doubles from mid-May to mid-August. The A team is geared for players at the 4.5 level and above; and the C team at 3.5 and above. Home and away matches start at 7pm on Thursday evenings for both teams. All members are welcome to try out in late April/early May and must try out to be eligible for the team. Members may only play for one of these teams. Practice time for both these teams is Sunday. These team members are B level players who play competitive doubles over a seven week period starting early May through the end of June. Matches are played Wednesday mornings starting at 10:00 am. All women members are welcome to participate in the try-outs which are held in mid to late April. Sign up dates, times and location will be announced in our spring Between the Lines newsletter. Practice times are on a weekday afternoon and alternate with the Ladies’ A team. In past years, one of our LPTC Pros has attended practices to provide the teams with advice on effective doubles’ strategy. A small fee is charged to participants at each practice to cover these coaching costs. The NYTA ladies’ team season runs from mid-May to late July. Matches are held Monday mornings at 9:30 am, alternating between home and away matches. Ladies who play at the A level are welcome to attend try-outs which will be held in mid to late April. Sign up dates, times and location to be announced in our spring newsletter. Practice times are on a weekday afternoon and alternate with the Ladies’ B team. Our InterCounty 55+ Mixed B team plays Thursday mornings from mid-May to mid-August generally starting at 10am. Players at the B level are welcome to tryout for this team. Sign up dates, times and location to be announced in our spring newsletter. Interested members: please email Games@LawrenceParkTennisClub.ca for more details and to register for any try-out. 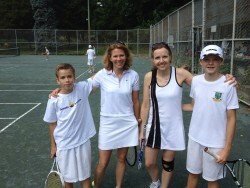 Our Club has participated for a number of years in the Tennis Toronto Junior Doubles League. This is a mixed league for both boys and girls (Under 12’s and Under 18’s) who wish to play competitively against other clubs around Toronto. Matches are all on Saturday afternoons. Consideration is being given to adding another team option for our Junior members; stay tuned! Interest is assessed at the beginning of the season so players should let our Junior Program Director (JuniorPrograms@LawrenceParkTennisClub.ca) know they are interested! Congratulations to our Junior Team players, the ‘Lawrence Park Lightening’ who won regionally and played in the FINALS in Nathan Phillip Square on July 20th, 2016. Click here for pictures! We will have a tennis professional facilitating the try-outs to assist in evaluating and ranking players. 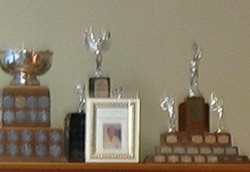 Ranking will be based on our team selection criteria (http://lawrenceparktennisclub.ca/wp-content/uploads/2014/12/2016-Team-Tryouts-Assessment-Criteria.pdf). With new players trying out each year, we cannot guarantee you will make the team of your choice. You need to attend at least one try-out. There will be a $15 fee for each 2 hour try-out, to be paid to the pro. There is a parking charge if you choose to use the underground parking at The Supreme Court facility. We suggest carpooling or, if available to you, attending with a current member of The Supreme Court in possession of a parking pass. We strive to run a thoughtful and inclusive team try-out process each spring and encourage members to give competitive interclub play a try if they are interested. Where there are more candidates than available spots on our teams, coaches use the following criteria to assess players’ abilities: Team Try-outs Assessment Criteria.